Poor alignment results in excessive and/or uneven tire wear. Tracking is the distance of each wheel to the vehicle's centerline. Each should be equidistant from this centerline so that, as the vehicle moves straight ahead, wheel tracks are parallel to the vehicle's centerline (e.g., the axle should not be cocked). To determine caster, first draw an imaginary line through the upper and lower ball joints. The angle made by this line (the steering axis) with another imaginary line drawn perpendicular to the ground (the centerline) is the caster. If the angle between the steering axis and centerline is toward the front of the car, caster is negative. If toward the rear of the car, caster is positive. 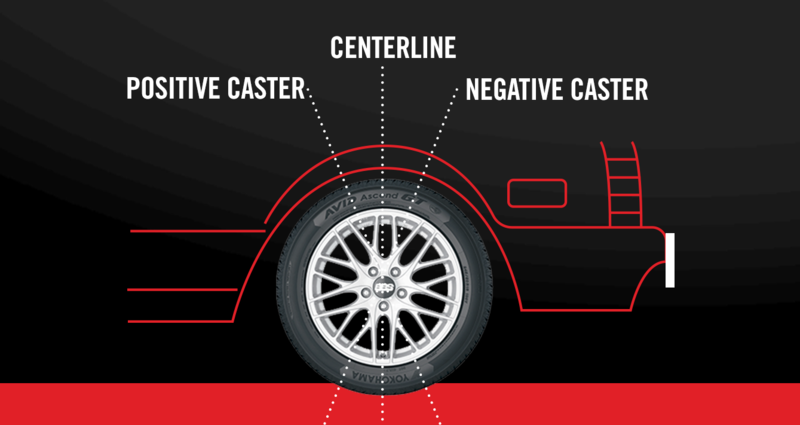 Measured in degrees, caster plays a large role in determining both steering feel and high-speed stability. The goal of proper caster alignment is to achieve optimal balance between low-speed steering effort and high-speed stability. An increasingly positive caster enhances high-speed stability but increases low-speed steering effort. An increasingly negative caster decreases low-speed steering effort and high-speed stability. For cars with power steering, an increase in low-speed steering effort increases the rate of wear in the power steering system. Viewed from in front of the vehicle, camber describes tilt of the tire from vertical. A tire has negative camber when its top inclines toward the vehicle. Positive camber occurs when its top tilts away from the vehicle. Camber is measured in degrees and varies by car model and year. A wheel's camber angle should be adjusted to maximize a tire's contact with the road's surface under given loaded cornering conditions. 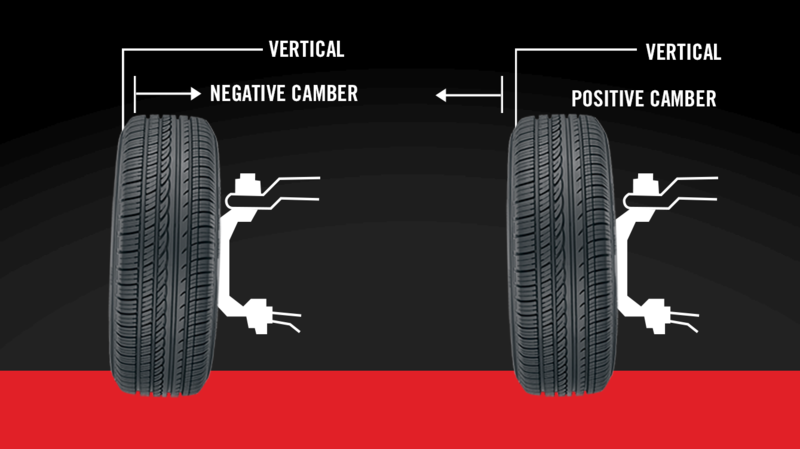 Because a tire's camber changes slightly as its suspension moves during travel, the static angle at which the camber is set will depend on driving habits. If a driving style entails hard cornering, outside tires (heavily loaded) will need to have a statically set negative camber. If driving is on highways where tires are mainly subjected to lightly loaded cornering conditions, the static camber setting should be zero or slightly positive. 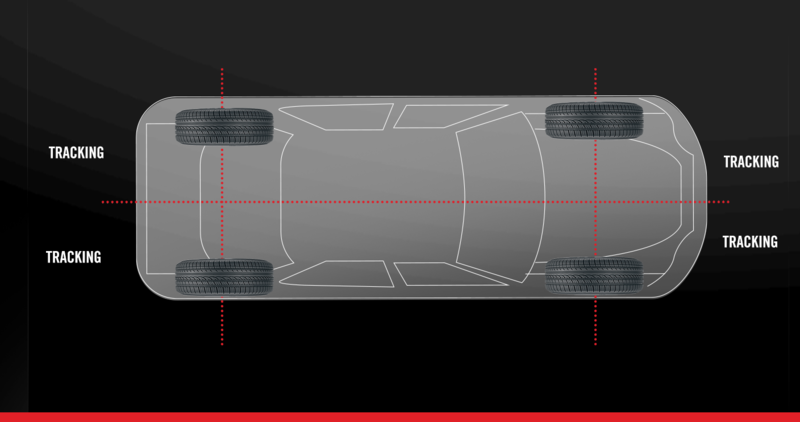 Camber plays a large role in determining both the overall handling feel of a vehicle and how a tire wears across its tread. A tire wears most at the point(s) where the majority of the vehicle's load rests. A properly set camber maximizes a tire's contact patch, leading to even wear. Excessive negative or positive camber has an adverse effect on tread life by causing premature outer or inner shoulder wear. 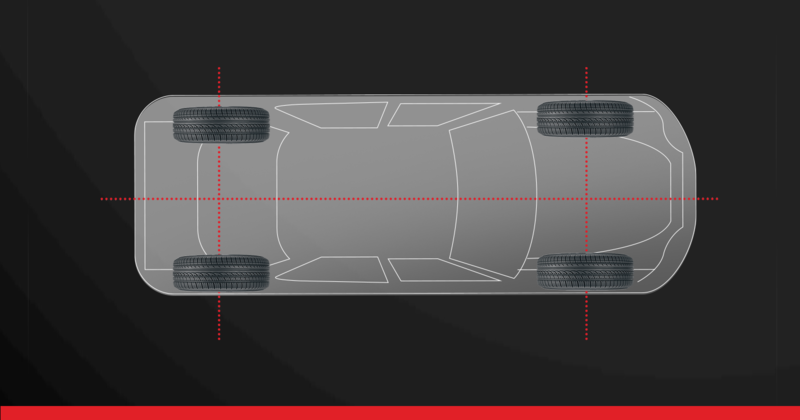 If you were able to view the front tires of a vehicle from above the car, you would expect them to look exactly parallel to each other. In fact, they rarely are. The difference in distance between the front edge of the tires and the rear edge is called toe. 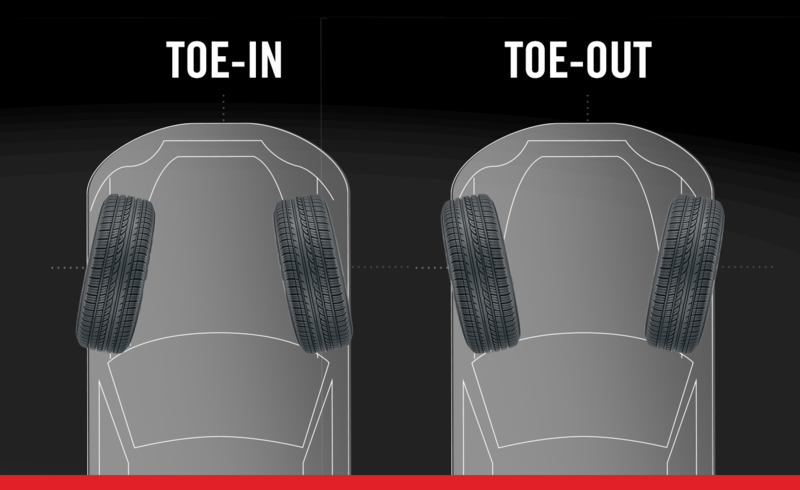 Toe describes how close to parallel the two tires are, and whether they are toed-in (closer at the front of the tire) or toed-out (closer at the rear of the tire). The goal of toe is to provide proper tire wear through various driving conditions. Assuming that the rest of the suspension is correctly aligned and maintained, and the tires properly inflated, toe-in will result in additional understeer for the car. In a corner, the inside front tire will turn at less of an angle than the outside tire. Additionally, excessive toe-in will result in premature tire wear through feathering and increased fuel consumption. Conversely, toe-out will result in additional oversteer for the vehicle. This occurs as the inside front tire turns at a greater angle than the outside tire. Thus, in a corner, the inside tire is trying to turn even more than the heavily-loaded outside tire. Excessive toe-out will also result in premature tire wear due to feathering and increased fuel consumption.